Please join us at our annual gala! 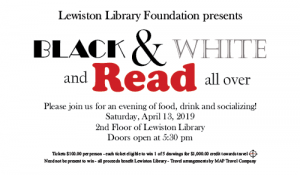 Saturday April 13, 2019 on the second floor of the Lewiston Library with doors opening at 5:15. Tickets are $100.00 per person. Each ticket eligible to win one of five drawings for $1,000.00 credit each towards travel. Need not be present to win. Buy your ticket today by contacting the library or a board member. We are excited to introduce new things that the Foundation is doing for the library.